Winter Hours Effective October 4, the bar & restaurant will be closed on Mondays. Ocean-wise certified harpoon-caught Swordfish with a Veracruz sauce, roasted local fingerling potatoes and sautéed local swiss chard. Suggested wine pairing: Gaba do Xil Mencia. Omelette with hot Italian sausage with mixed peppers and provolone. Although Gillian has left us for warmer climes this winter, she has left behind a great new cocktail list. Come in and try one of KYC's signature cocktails! This week's beer is MacKinnon Brothers' Red Fox Summer Ale, an easy drinking summer ale infused with beets with a crisp citra hop finish. James, Neil & Greg are working on plans for some exciting events at KYC this winter. First up will be TGIF's featuring tasty and delicious dinner specials with wine pairings. Watch out for our Oktober Fest themed TGIF later in October. Chef Neil will be pulling out all the stops for KYC's annual award night on November 7. We will also be hosting a wine pairing dinner on November 21. There will be an exciting slate of holiday parties at KYC with old favorites and new events planned. The Roast Beast Feast & Carol Sing will be on December 5, the Kid's Christmas Party will be on December 13 and an exciting new event The Holiday Cocktail Party will be on December 19. 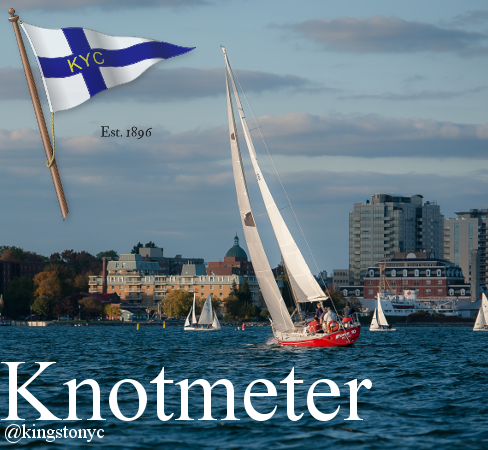 Keep an eye on the Knotmeter for more details. September Gas Dock hours will be 0900h - 1700h, seven days a week. Brad Strawbridge, our indefatigable yard steward will be manning the Gas Dock from Monday to Friday. As a result of Brad's other duties, he does get called away from the Gas Dock periodically, please be patient and he will do his best to be back as soon as possible. Weekend Gas Dock service will continue as normal. Come down to KYC for yoga, every Monday! Where: September classes will be held outside (Weather permitting) however please meet at the Clubhouse first. Our KYC Chase Race will close out racing for the year this Saturday, Sept 25. Thanks to Don Ruddy, Ross Cameron, and Robert & Christina Weguelin for helping our volunteer race committee crews run & score the races this month. As many of you will have noticed, KYC is lucky to have a beautiful garden between Saint's Rest and the Parking lot and it is all the work of Debbie Loder. This month all her hard work was recognized by the Kingston Blooms competition, where her garden won first place in the Large Garden category. Debbie wants to extend a warm thank you to all of the people who voted for her garden. These votes placed her in the top three gardens of her category, which were then judged by the Kingston Blooms judges. Debbie was given a beautiful maple leaf plaque to be placed in her garden. Congratulations Debbie! Kingston Power & Sail Squadron will be offering a large number of boating courses through the fall and winter and all the courses will be hosted at KYC. Restricted Maritime Radio - Saturdays, Oct. 3, Nov. 21, Feb. 13, April 9 from 10:00 am to 4:00 p.m.
Boat Projects - (NEW) Tuesday, Nov. 17 from 7:00 to 9:00 p.m. Sailing - Wednesdays March 2 to May 4 from 7:00 to 9:00 p.m.
Marine Systems Related Maintenance- Wednesdays Jan 6 to Jan 27 from 7:00 to 9:00 p.m.
Marine Diesel Engine Maintenance - Saturday, Jan 9 from 9:00 a.m. to 3:00 p.m.
Boat Electrical Systems - Wednesdays, Feb. 10 to March 2 from 7:00 to 9:00 p.m.